Dive into your handmade gift preparations with the 2017 issue of A Somerset Holiday. 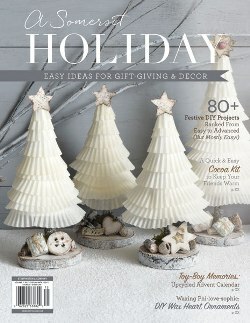 This issue puts a rustic-chic spin on the holidays by offering fun and simple ideas for handmade gifts. Inside this issue you will find a variety of gift wrapping and decor ideas, like Dalia Blevins’s sweet little snowmen salt shakers, and Carol Fisher’s Putz house village crafting kit. And for those who want to personalize your gifts but just don’t have time, look no further than the A Little Bit Handmade department to create gifts with a handmade touch in minutes.